The Rebel Sweetheart. : Park Gun Tae | Kkonminam Rising. 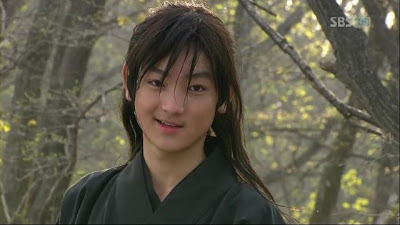 As young Yeo Un in Warrior Baek Dong Soo. Turns out, this young man is Park Gun Tae whose acting career has spanned four movies and ten highly successful dramas - including Time Between Dog and Wolf. 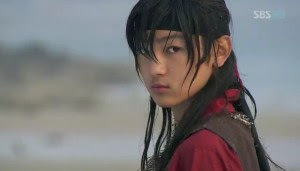 As young Lee Soo Hyun in Time Between Dog and Wolf. Now seventeen (he celebrated his birthday last February 5), Park Gun Tae truly has the makings of a great actor. 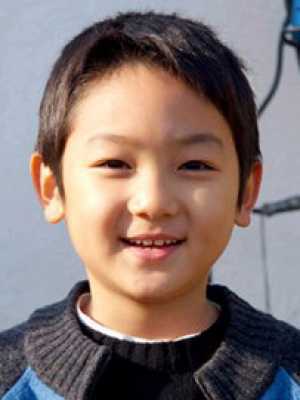 His performance in the 2008 drama East of Eden earned him the Special Child Actor Award from MBC. And now, as the young Yeo Un in Warrior Baek Dong Soo, he commanded attention to the drama with his strong acting, charismatic smile, and undeniably, his kkonminam looks. His splendid performance, albeit short (they have to grow up in the drama, you see), reminded me of some of my favorite and talented actors. I'll itemize them so as not to confuse you with the names. See? I told you I love period dramas, lol. And no, this has nothing to do with their seemingly similar gorgeous mane of hair. Watch out world, this rising kkonminam is not just a pretty face. He definitely has the acting skills to boot. Sharing the ramblings on 366.